The IMAK® Active Gloves help encourage a healthy lifestyle by relieving aches, pains, and stiffness associated with hand pain. The unique design provides mild compression for warmth and helps increase circulation and promote healing. 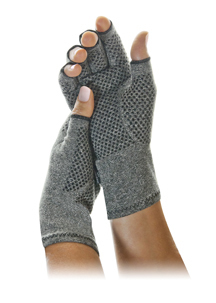 The Active Gloves are made of a soft breathable cotton material. The open fingertips and anti-slip design allow full freedom to feel, touch and grip all day. The Active Gloves are available in 3 different sizes.